The Touch ID was one of the great expected from the keynote last Tuesday, after a year of rumors, Apple finally presenting his fingerprint sensor. With it, the Home button completely reinvented to accommodate this technology inside so you can unlock your device with the tip of your finger . Thanks to this, the eternal battle between security and convenience, which many people prefer to go without any unlock code on your iPhone to save a few seconds, it will end. Touch ID aspires to become one of the hallmarks of the brand. 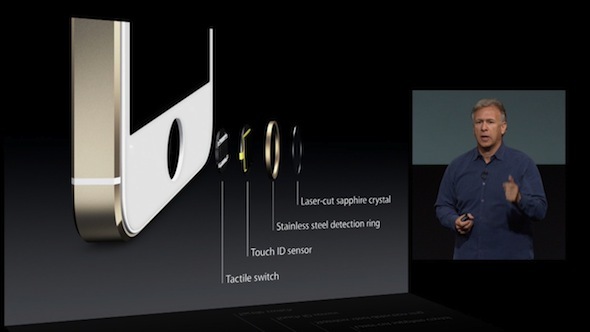 Touch ID will allow us to unlock our device and authorize purchase on iTunes with the tip of your finger. The Home button on the iPhone has become the most identifiable seal the device, as well as from other iOS products. Besides being an efficient way to activate the system, is a fast and instant leave any application and return to the home page. For this reason, introduce the Touch sensor button ID in that much sense. The sequence has followed Apple for its manufacture is very intelligent. A sapphire crystal lens scratch proof to protect the sensor to detect our ring finger and the sensor captures and verifies our finger. Having never used one finger to press the Home button, Touch ID allows the creation of different profiles with each finger of your hand , can add up to 5 if we believe appropriate. In the same way, we can also create profiles with traces of different users in case someone else will have access to the iPhone. To reassure many users, Touch ID will be able to read up to the subcutaneous layers of the skin , so we can cut your finger and use it to unlock the iPhone. What a relief! Apple still needs further enhance this technology, introducing the possibility, among other things, to establish a hierarchy and some permissions to different user profiles. For example, someone could unlock your iPhone, but not be authorized to make purchases on the App Store. What do you think of the new Touch ID? Do you think that technology is a revolutionary?